The D-Link DWA-652 Xtreme N Notebook PCMCIA card is a 802.11n wireless client that delivers unrivaled wireless performance for your notebook computer. This wireless adapter delivers up to 14x faster speeds and 6x farther range than 802.11g while staying backward compatible with 802.11g networks. Once connected, you can share a high-speed Internet connection, photos, files, music, videos, printers, and storage. This The D-Link DWA-652 Xtreme N Notebook PCMCIA card is powered by Xtreme N technology to provide superior wireless reception in your home or office. This adapter is designed for use in larger homes and offices, or for users running multiple bandwidth-intensive applications. 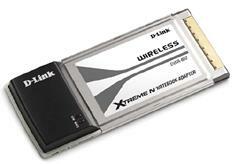 You can connects your notebook computer to a wireless network by using this D-Link DWA-652 Xtreme N Notebook PCMCIA card to access a high-speed Internet connection, transfer files, and stream media from greater distances around your home or office. The DWA-652 supports WPA™ and WPA2™ encryption that allow you to connect securely to a wireless network. D-Link's Quick Adapter Setup Wizard guides you step-by-step through the installation process. Configure this notebook adapter without having to call a networking expert to help you. The D-Link Wireless Manager is also included with this product to keep track of all your most frequently accessed networks so that you can join them quickly and easily. With unmatched wireless performance, reception, and security, the D-Link Xtreme N Notebook Adapter (DWA-652) is the best choice for easily adding or upgrading wireless connectivity to your notebook computer. I bought this card to use for penetration testing with BackTrack Linux (v4 R1). It works perfectly and is supported by the ath9k driver (it has an Atheros chipset). This card supports monitor mode and can inject packets. If you need a reasonable priced card that will work on Linux, this is it. Purchased this for my wife's computer and after a few minutes of configuration I was able to connect to my Linksys WRT150N router and presto! Works great and is faster than my Buffalo 802.11G PC card. I plugged theis N network card in, ran the setup and was easy to do so. I get no faster responce times then from this G band network card. Both my internal G and this N card, durring testing, show only 56k speeds. My internal G card, in side my side testing with another similar laptop, was actuially a bit faster. I dont see any reason to buy this card. My rating for this D-Link adapter, might be a little unfair. I have used and am using D-Link products and love them. I have upgraded my network to 80211n and wanted to do the same with my laptop. So I ordered the DWA-652. The first problem I encountered after installing the driver software, was after the reboot. It changed the way Windows XP Pro opened, and I was unable to connect to my network. E-mailed D-link. They had me download latest update, do the un-install and install update. Windows opened properly, but didn't fix connection. After 4 more D-link attempts to resolve problem, they stopped responding. I re-installed my D-link WNA-2330 and everything worked fine. This issue will not prevent me from buying D-link in the future and will always recommend their products to others. I can't say enough good about AMAZON.COM. They are a wonderful site to do business. I have bought sdhc cards, cameras, and printers and more. Always with satisfaction. Their return site was flawless. Another satisfied and future return customer. DWA 652 works on Window XP SP3. You need to download the latest driver on the Dlink website instead of using the driver on CD. You have to disable the built in wireless card and uninstall any wireless driver on your laptop. DWA652 works well on my laptop running Window XP SP3 with all latest drivers. I got 100% signal at 300Mb connection! (Remember, read the manual and follow exactly the manual. Otherwise, it won't work!) Don't insert the DWA652 before you install the driver.